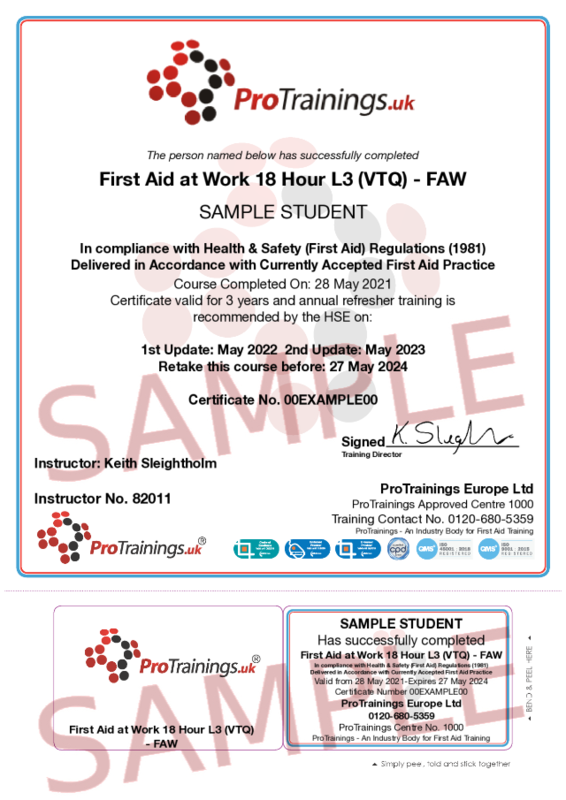 The ProTrainings First Aid at Work Level 3 (VTQ) qualification (FAW) is ideal for most businesses whose risk assessment has identified that they require a fully trained first aider for their workplace. All courses are delivered, evaluated and quality assured to meet the new guidelines and meet the requirements of the First Aid at Work (First Aid) regulations 1981 and subsequent including the 1st October 2017 changes. All our first aid courses fully meet the UK and European Resuscitation Council Guidelines 2015 as per the HSE requirements (2015 are the latest guidelines). ProTrainings Vocational Training Qualifications (VTQ) are fully recognised by the HSE as Trade Body Qualifications. This course must be at least 18 contact hours and run over a minimum of 3 days and the certificate is valid for 3 years. To renew you need to attend a 12 contact hour 2 days FAW requalification course. In May 2016 the HSE and Awarding Organisations announced that computer-based blended training is now allowed for all workplace first aid courses. You can now become a fully qualified First Aider in the workplace, with two days of classroom training after completing this online course. Reduce your training and travel costs by using our engaging, blended online video-based course. Learn at your pace, one to one with your instructor at a time that suits you. Please note that learners undertaking a ProTrainings Trainings Course have the option to choose to take a regulated qualification. The ProTrainings First Aid at Work Qualification is accepted by TQUK as a qualification for first aid instructors who wish to offer their regulated qualifications. This is because it meets all of the required learning outcomes and due diligence. This course comes with 18.0 hours of CPD, although the time to complete the course online may be less than this.